Wallpaper is commonly used as either a decorative feature, or lining paper applied to the wall in preparation for painting. Plain wallpapers are in some ways easier to work with, as you don’t need to be concerned with pattern matching. However they don’t pack the same punch in terms of decorating your interior. 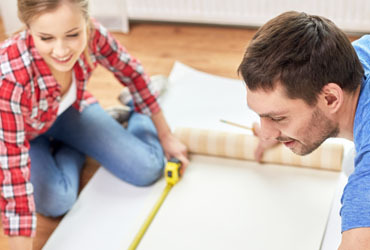 First, you will need to calculate the meterage of the wall space that you plan to cover. For example, if you are creating a feature wall then you will need to use less paper than if you are wallpapering the whole room. Take the width of each wall you intend to cover and divide the total width of all walls by the width of the wallpaper to give you the number of drops required. Next take the height of the walls and multiply by the number of drops to give you the meterage required. Remember to account for pattern repeats if you choose a decorative wallpaper, otherwise you may run out of paper. You can wallpaper over existing wallpaper or paint, but it is important that your base is smooth and clean. Stick down any sections of the original paper that have lifted, or smooth out rough sections of paint before you start re-papering. Once you are satisfied, wipe the surface with a damp cloth and leave to dry. Next, prepare your paper. Measure out the length for your first piece and apply paste to the reverse. If you are wallpapering the whole room, it is advisable to hold the first piece up against a free corner with no obstacles and check the alignment, be sure to slightly overlap the paper over the corner before adhering it to the wall. This way when you stick down the final adjoining corner piece, you can cut it directly in line with the corner to avoid gaps appearing. If papering a feature wall then it is best to start in the centre and work outwards, in order to centralise the pattern, so the outer edges are identical. Be sure to stick the paper in line with the corner for a tidy edge. Once the first piece of wallpaper has been fixed, you can measure out the subsequent drops one by one and adhere them in alignment with the previous edge. When cutting your wallpaper, remember to account for any pattern repeats. You can avoid obstacles such as light switches and sockets simply by measuring the area out and cutting the excess paper to accommodate your fitting. Then continue wallpapering as above. For more handy hints and tips on renovating your home check out our earlier blogs on How to Choose Your Paintbrush and Painting Internal Doors.